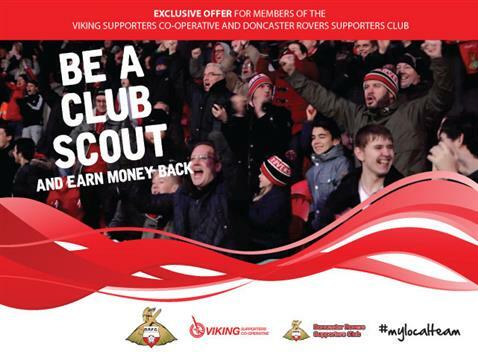 Print Page - Viking Supporters Co-operative - Have you already got your 2015/16 Doncaster Rovers season ticket? Have you already got your 2015/16 Doncaster Rovers season ticket? If so, then you have the opportunity to earn money back from Rovers by finding new season ticket holders. Under the ‘Be A Club Scout’ scheme 2015/16 season ticket holders, who are also members of the VSC or the Doncaster Rovers Supporters Club, are encouraged to recommend new season ticket holders. Once the new season ticket holder has paid for their season ticket in full, the scout will be entitled to the difference between the full price and the early bird price (up to £40). Complete this form, return it to the VSC (or the Supporters Club) and we will do the rest. The closing date for this offer is 3rd May 2015.